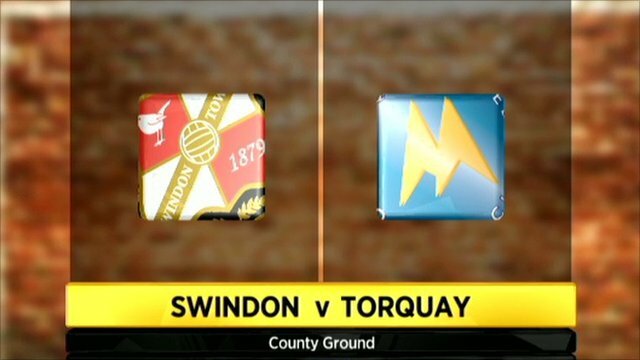 Swindon saw off Torquay to progress to the southern area quarter-final of the Johnstone's Paint Trophy. Elliott Benyon had a great chance to put the visitors ahead in the first minute but David Lucas saved well. The hosts quickly bounced back as David Ball gave them the lead by firing into the top corner from six yards out to open his Town account. Vincent Pericard got his first home goal to seal the win as he slotted under Danny Potter from 16 yards. "You've got to tip your hat to Torquay as they came to play football and at times I thought their passing and moving was exceptional. "The goal gave us some impetus and after that we played some excellent stuff and the counter-attacking football was terrific. "The back four looked really solid for us today and that gave us the confidence to go forward and give the service to our three strikers." 90:00+3:23 The match has reached full-time. 90:00+1:34 Simon Ferry has a lobbed shot. Save by Danny Potter. 90:00+0:48 Long range effort by Matt Ritchie goes wide right of the target. 89:32 Elliot Benyon is caught offside. Free kick taken by David Lucas. 88:23 Shot from 18 yards from Jon-Paul McGovern. Save made by Danny Potter. 87:58 The official flags Matt Ritchie offside. Indirect free kick taken by Danny Potter. 86:44 Free kick awarded for an unfair challenge on Elliot Benyon by Michael Rose. Wayne Carlisle takes the direct free kick. 82:44 Kieran Charnock has a headed effort at goal from just inside the penalty area that misses to the right of the goal. 82:21 Corner from right by-line taken by Wayne Carlisle. 79:38 Short corner taken by Matt Ritchie from the left by-line. 79:01 Short corner taken by Matt Ritchie. 78:49 Matt Ritchie takes a shot. Save by Danny Potter. 77:46 Matt Ritchie takes a shot. Save by Danny Potter. 76:04 Short corner worked by Matt Ritchie. 74:45 Substitution Alan O'Brien replaces David Ball. 74:13 The assistant referee signals for offside against Matt Ritchie. Free kick taken by Danny Potter. 72:36 Outswinging corner taken by Wayne Carlisle from the right by-line, free kick awarded for an unfair challenge on Sean Morrison by Kieran Charnock. Direct free kick taken by David Lucas. 70:03 The assistant referee flags for offside against Vincent Pericard. Danny Potter restarts play with the free kick. 69:50 Unfair challenge on Michael Rose by Martin Gritton results in a free kick. David Lucas takes the direct free kick. 68:16 Substitution Chris Robertson goes off and Lloyd Macklin comes on. 66:24 Inswinging corner taken by Matt Ritchie from the right by-line played to the near post, clearance made by Wayne Carlisle. 66:13 Nathan Thompson takes a shot. Save by Danny Potter. 65:52 Unfair challenge on Matt Ritchie by Wayne Carlisle results in a free kick. Free kick taken by Simon Ferry. 63:01 Corner taken right-footed by Eunan O'Kane from the left by-line, clearance made by Jonathan Douglas. 61:15 Lee Mansell gives away a free kick for an unfair challenge on Jonathan Douglas. Free kick taken by Jon-Paul McGovern. 59:21 Substitution Martin Gritton comes on in place of Nicky Wroe. 59:08 Effort from the edge of the penalty area by David Ball goes wide of the left-hand post. 58:12 Shot by Jon-Paul McGovern. Save by Danny Potter. 57:12 Foul by Nicky Wroe on Jonathan Douglas, free kick awarded. Free kick taken by Jonathan Douglas. 49:53 Corner taken by Wayne Carlisle from the left by-line, save made by David Lucas. 49:40 Eunan O'Kane takes a shot. Save made by David Lucas. 48:27 Elliot Benyon produces a right-footed shot from the edge of the box and misses to the right of the target. 45:01 Substitution (Torquay) makes a substitution, with Wayne Carlisle coming on for Danny Senda. 45:00+2:36 The half-time whistle blows. 45:00+2:10 Elliot Benyon concedes a free kick for a foul on Sean Morrison. David Lucas restarts play with the free kick. 45:00+1:06 The assist for the goal came from David Ball. 45:00+1:06 GOAL - Vincent Pericard:Swindon 2 - 0 Torquay Goal scored by Vincent Pericard from just inside the penalty area to the bottom right corner of the goal. Swindon 2-0 Torquay. 45:00+0:24 Effort from outside the penalty area by Simon Ferry goes wide left of the target. 44:03 Short corner taken by Matt Ritchie. 43:33 Free kick awarded for an unfair challenge on Matt Ritchie by Chris Robertson. Free kick crossed left-footed by Michael Rose from left channel, Mark Ellis makes a clearance. 42:25 Booking Kieran Charnock receives a caution for dissent. 41:23 Lee Mansell concedes a free kick for a foul on Nathan Thompson. Nathan Thompson takes the free kick. 37:53 Close range shot by Vincent Pericard goes wide of the left-hand upright. 34:38 Kieran Charnock fouled by David Ball, the ref awards a free kick. Danny Potter takes the free kick. 32:33 Danny Senda fouled by Matt Ritchie, the ref awards a free kick. Direct free kick taken by Mark Ellis. 29:42 Effort from just inside the penalty area by Simon Ferry strikes the post. 28:03 Elliot Benyon challenges Michael Rose unfairly and gives away a free kick. Free kick taken by Sean Morrison. 26:28 Substitution Nathan Thompson joins the action as a substitute, replacing Scott Cuthbert. 19:33 Jon-Paul McGovern takes a shot. Save made by Danny Potter. 18:46 Scott Cuthbert concedes a free kick for a foul on Danny Senda. Free kick taken by Kieran Charnock. 9:32 Vincent Pericard provided the assist for the goal. 9:32 GOAL - David Ball:Swindon 1 - 0 Torquay David Ball fires in a goal from close in to the top right corner of the goal. Swindon 1-0 Torquay. 8:08 The referee blows for offside against Elliot Benyon. Scott Cuthbert takes the free kick. 3:46 Left-footed shot by Michael Rose went wide left of the net. 2:01 Billy Kee takes a shot. David Lucas makes a comfortable save. 0:14 Elliot Benyon takes a shot. Save by David Lucas.